For survey participants, knowing that Survey Administrators can’t trace your responses to your identity increases both the likelihood that you will complete the survey, as well as the honesty of their replies. To preserve your survey confidence, Zarca does not sell your information to any outside parties and does not share it with anyone but Account Administrators, authorized Sub-Account Users, and other Zarca staff that are troubleshooting or providing support for your account. Knowing your data is not being shared with any outside parties enhances survey relationships and survey confidence. At Zarca, we are mere custodians of your information. We do not look at, share, or sell the results of your survey research. Your information is secure and only accessible to you and a dedicated Relationship Manager assigned to your account. With the advent of Spam filters, it has become even tougher to make sure your invitations and reminders are viewed by your audience. That is why Zarca has developed its own built-in Spam Filter Beater, which prevents your email from being lumped in with other Spam or junk mail. It’s also recommended that Survey Administrators not put too much multimedia (images) in their invites and not embed their surveys within the email message. Doing this will help prevent some Spam filters from misidentifying your invite as Spam. Everyone likes to have choices. With regards to surveys, not everyone will want to be included in your pool of survey participants. That is why Zarca has implemented an optional feature to customize a survey “opt-out” notice. Survey Administrators can use a default opt-out message, or create their own personalized memo. 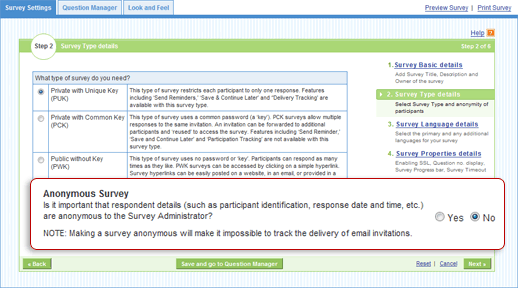 Those who receive invites then have the option to opt-out of the current survey or decline any further survey invites. Invite reminders are a powerful way to prompt survey participants to take your survey. However, just as with invites, it’s important not to send too many reminders, as this will lessen the likelihood that your survey will be completed.